Hong Kong Mahjong (with the acronym HKOS which stands for Hong Kong Old Style) is probably the most popular variation of mahjong played in China. 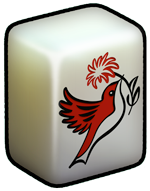 HKOS mahjong's gameplay and form is very similar to Chinese traditional mahjong. HKOS uses a progressive scoring with doubles (fan). Pungs and kongs no longer earn points, instead, fan are earned corresponding to a payout table. Mahjong is a Chinese game of skill that generally involves 4 players. Mahjong is similar to gin rummy: the goal in mahjong is to build sets and get the highest point values. Each mahjong player selects and discards tiles until a full set of combinations is built. A full set of tiles is shown in a table below. There are only 4 Mahjong Flower and Season tiles. When drawn, Flower and Season tiles are declared and a substitute tile is drawn. Flower(s) or Season(s) that correspond to the winning player's wind may increase the score. The Flowers are represented by a plum (1), an orchid (2), a chrysanthemum (3) and a bamboo (4), and Seasons by a fisherman, a woodcutter, a farmer and a scholar. Upon start, tiles are turned face down and shuffled, and each of the 4 players builds a wall of 2 tiles high and 17 across (or 18 across is playing with Flowers and Seasons). After that, players combine their walls to form a square like in a picture below. The game proceeds counterclockwise: East > South > West > North. 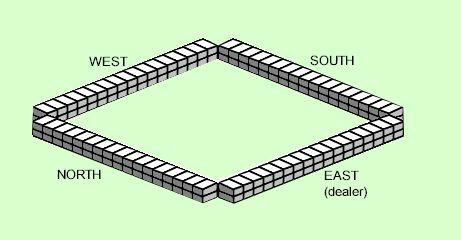 East throws three dice, and uses the sum of the dice to determine which side of the wall will be the starting point: count proceeds counterclockwise around the walls, starting with Eastern wall and number 1, so that numbers 5, 9, 13, and 17 would correspond to East, numbers 2, 6, 10, 14, 18 would indicate South, numbers 3, 7, 11, 15 would mean West and numbers 4, 8, 12 and 16 would indicate North). Next, starting from the right side of the indicated player's wall, East counts off stacks clockwise until dice sum is reached. After that, East takes the next two stacks (four tiles) after the last stack counted. South takes the next two stacks, West takes the next two, then North takes the next two. All players continue to take stacks in turn until each player has six stacks (12 tiles). Note: players take turns going counterclockwise, but tiles are drawn from the wall clockwise. This applies when dealing tiles and during gameplay. Each player then draws one extra tile with East drawing one last one at the end to begin with 14 tiles. Any flowers or seasons are declared and immediately placed face up to the side of the hand, and are replaced with tiles drawn from the end of the Dead Wall (where the wall was broken) in the order of East, South, West, and North. Upon discard, other players can choose to pass, or to take the tile to complete a set (pung, chow or kong - see below), or to declare a win ("mahjong").